Hair accessories are a charming part of a woman’s look. They are the perfect way to express your personal style, and can really spice up a simple outfit and they can even save you from bad hair days. Hair accessories are the perfect way to style short hair because they are practical, chic, and effortless. You can see these new hair accessories everywhere from magazines and catwalks to the sidewalk and your social media. Best of all, they are multi season. If it is summer than grab a silk head wrap, and if its winter pick up some wool turbans. They look stylish if you are simply lounging around, running errands, or going out on the town. You might think this look is just for those girls with long hair, but that is far from the truth. There are plenty of stylish ways short hair can wear turbans. Bow – This vintage style works great for short hair. 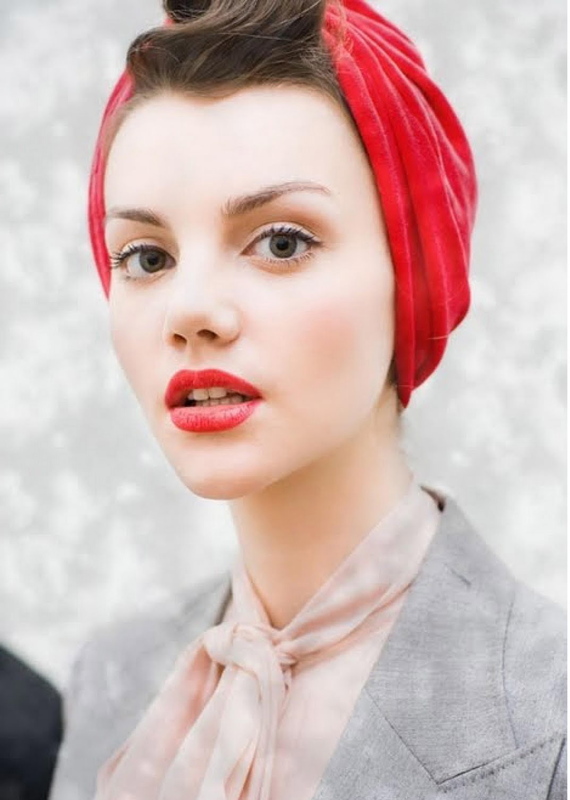 Simply tie the turban around your head and make a cute bow on the side. Knot – Take a shorter scarf and wrap it around your head from under your hair to the top, or from back to front and tie the ends in a knot on the top of your head or the front of your forehead. Headscarf – This looks best on short hairstyles. Simply tie a short scarf or fabric around your head as if it were a headband. Turbans are a great hair accessory for short hair. If you have short hair then a variety of headbands are a must. It’s an easy way to add glamour to your hairstyles for every occasion. Although you want to make a statement with your headband, huge bows or thick headbands can be too intense for short hair. Depending on the length of your hair should determine the size of the headband you choose. If you have shorter hair such as a pixie try to keep your head bands less than 2 inches wide because wide bands can be overpowering for your short hair. If you have a bob or shag style then you can go thicker but keep still keep it simple. Headbands also create great volume and are perfect for styling your hair if you are trying to grow it out or change the style. If you are looking for the latest trend in headbands then you have to try studs. Studs are everywhere today from purses, shoes, shirts and they aren’t excluding headbands. Studs use to be for the ‘gothic’ style exclusively, but now they are for everyone’s look and are the perfect headband accessory. This simple headbands looks good from day to night. This is the ultimate and traditional hair accessory for short hair. They can also be the trickiest to shop for. If they are too big they look tacky and can fall out, but if they look ‘too cute’ they can come off as childish. The best way to avoid that is to bright colors and princess-themed barrettes. Try to keep it simple, with gorgeous colors such as turquois, or yellows. Of course color depends on your hair color and outfit. Don’t be afraid of vintage bows or flowers, just make sure they look age appropriate. If you are going to a formal occasion then try styling your short hair with gems or jeweled barrettes. The latest trend in barrettes is definitely small animal shapes. People love putting bold elephants, snakes, owls, etc. in their short hair. Perhaps you want something fun and playful for your hair and you can’t go wrong with a red elephant. This simple yellow barrette is captivating with short hair. Flowers aren’t right for every occasion, ensemble, or even season but that doesn’t take away from their trendiness and beauty. They are a versatile hair accessory and can add effortless style to short hair. You can wear flowers behind your ear, on a headband, attached to barrettes, or a floral pattern turban. Regardless of your hair accessory of choice, you can find a way to wear flowers. Flower headbands come in every just about every style you could be looking for. If you want thin leather flowered covered headband to accessorize your pixie, or bold colors with metal flowers or delicate small cloth flowers, you can’t go wrong with flowers in your hair. Flowers Barrettes are a great choice if you have a wedding or party to go to, then definitely consider a bold flower barrette. Part your hair to one side and place in a flower that compliments your ensembles color and style and within seconds you will look glamorous and playful. 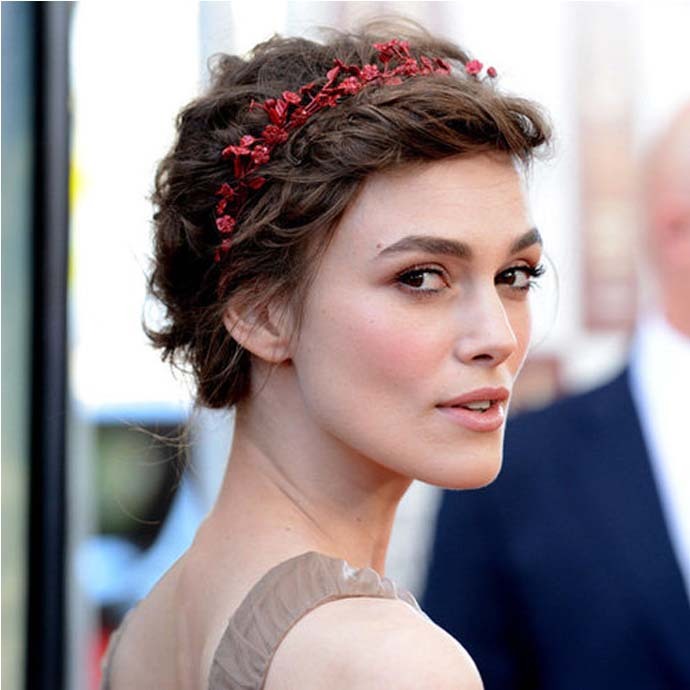 This bold flower headbands adds contrast and style to short hair.